Let’s say you have a server that has been lovingly hand-crafted that you want to containerize. Figuring out exactly what software is required on there and what config files need adjustment would be quite a task, but fortunately blueprint exists as a solution to that. 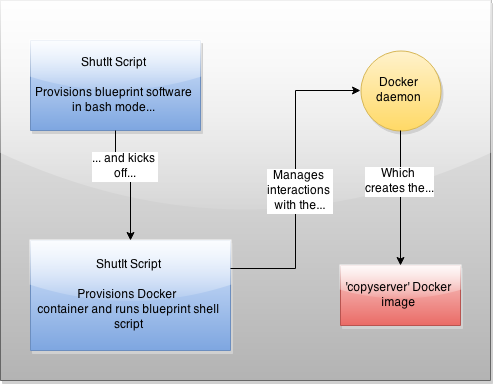 You kick off a ShutIt script (as root) that automates the bash interactions required to get a blueprint copy of your server, then this in turn kicks off another ShutIt script which creates a Docker container that provisions the container with the right stuff, then commits it. Got it? Don’t worry, it’s automated and only a few lines of bash. The pre-requisites are python-pip, git and docker. The exact names of these in your package manager may vary slightly (eg docker-io or docker.io) depending on your distro. You may need to make sure the docker server is running too, eg with ‘systemctl start docker’ or ‘service docker start’. There is a prompt to ask what docker base image you want to use. Make sure you use one as close to the original server as possible, eg ubuntu/trusty or ubuntu:14.04 rather than just ‘ubuntu’. You are now in a practical facsimile of your server within a docker container! to an issue on github. I was able to create a docker image of my server, but when i tried to run it the container runs only as root. If I try su – username, it says this account is currently not available. Is there any other way to run the container as ubuntu user. I try to convert a tiny wikimedia server. I did not understand what this script do, but does it need an internet connection? Because in my enviroment is it only possible via proxy. Why Are Enterprises So Slow?